You Can Learn To Crochet. Anyone can learn to crochet and is an easy craft. Today more than ever, society is driving at a blazing pace. The increase in stress is driving many to find better rest and relaxation to counter it. Beginners crochet patterns can find you a new and improved stress reliever with this fun arts and crafts hobby! Even if you aren't already familiar with crocheting, you can easily learn this great creative skill as well. Starting With a Beginners Crochet Block. Just as babies start crawling, those learning beginners crochet techniques stitch a basic block. You will need a few items to start, among which will include your preferred yarn color (worsted-weight type), small scissors, a size G crochet hook, and a yarn needle with an eye large enough for the yarn. You will generally start with a beginners crochet block; as it is the start of many other projects. This beginners crochet block in itself can be very useful. If you make enough of them, you can sew them together to make hats, Afghans, and many other warm and creative items. You should begin by holding your crochet hook in your right hand. If you are left-handed it may take a little practice, however you will make it easy with practice. You will need to make a slipknot on the hook. Then you bring the yarn free flowing behind the hook to the front and grab it with the hook. Bring the slipknot to where the hooked yarn goes through the slipknot and back onto the hook. 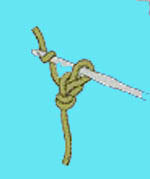 This action leads to a one chain stitch. The full procedure making the slip-knot and drawing the remaining yarn through it needs to be done another 28 times so you will have 29 stitches in the chain and a loop on the crochet hook. As you learn to crochet this will become easy. Keep practicing these beginners crochet stitches and you will be amazed in time. It doesn't end there. You continue but skip the first chain stitch that was created. The hook should be put in the middle of the second chain stitch. Your yarn should be pulled through it and back onto the hook where you will now have two loops. The free-flowing yarn on the back of your hook then needs to be pulled through both loops. In the end you will find one loop on the hook, which is your first, finished crochet stitch. Repeating these first beginners crochet stitch about another 27 times is what you want to do next. You should make counter-clockwise turns on each new row. You will undoubtedly have directions and it is very wise to read them well. As you learn to crochet you will find many useful instructions and don't fear them; rather conquer them. As a beginner learning crochet, you will no doubt find a little frustration at times. Often others find themselves driven by many motives to continue doing this craft for many years getting past the frustration. You can create many great and useful items for wearing and making your home warm. In short time you will likely be replacing your beginners crochet patterns with ones that are much more elaborate. If you have any questions or crochet ideas please contact me and I will add it to my site.